The spinner design mentioned yesterday was modeled. Some of the complex shapes in the original design were simplified. The area meant to hold the magnet was going to be an extruded rhombus but after seeing the model it seemed like it should be a cylinder. Making a rhombus is now possible with experience in relevant commands. Instead of cutting and gluing neoprene washers a grommet was selected. Grommets available at a local hardware store provide a lip which can be locked into place although a high amount of tension isn’t necessary. The cylindrical hole through the grommet limits spinner movement and could even be squeezed so the deformation would guide the spinner. Modeling the spinner was done as a whole but the spinner was cutaway so it could be printed in halves. 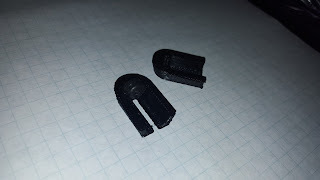 Printing in halves ensures that a good finish will be made on the internal parts of the spinner and will allow a grommet to be installed. No parts were modeled to attach the halves so it would be glued. A print was made but imperfections in the print lead to warping so the halves do not fit together correctly. Additionally the grommet doesn’t have enough clearance. There was no reason to make the grommet a tight fit so the next model may have a socket for the grommet which is intentionally oversized.